Cooking turkey breast in an oven bag saves you so much effort! Why? You simply can’t go wrong using an oven bag. A few years ago, a reader suggested that I try them and I became a convert. Turkey breast is famous for becoming over done and becoming very dry and inedible. I cooked turkey breast in the slow cooker and that was pretty good because all the moisture remained inside the slow cooker. The problem was getting the timing right so that turkey was perfect. I have also cooked an entire turkey in a bag and that was easy but I don’t usually cook an entire turkey for my family (turkeys are large!). The Reynolds bags come with easy instructions for all sorts of turkey. My turkey breast was 8 pounds and was bone in (at the very bottom of the scale) and took exactly 2 hours to cook at 350 F. I calculated 13.5 minutes per pound based on the above chart. Do not stand there obsessed with whether or not your turkey will be done perfectly because it will be done perfectly and your family will throw a party for you when the turkey breast is moist and delicious. I checked about 10 minutes before it was done with a digital thermometer. This is the other tool you need to ensure your turkey is perfect. You are aiming for 165 F.
Pull it out of the oven, cut open the bag, pull out the turkey breast and there is almost no clean up. Do you have to scrub the roasting pan because of the burnt on pan juices? No!! You are done in a matter of minutes and you simply toss out the bag. I know the green groovies are going to come after me – but this is far better than buying 1 pound plastic bags full of sliced turkey breast from the deli counter once per week. The turkey tastes so much better than the sliced meat from the deli counter and you will save a ton of money. I made a video for an entire turkey in a bag - but the steps are the same. Give it a minute to inspire you to cook your own turkey. So happy you like oven bags and my suggestion! As for the mess - with bag or without I use the turkey juices to make gravy. If I don't use a bag I whisk the roasting pan with the juices and water to scrape up all the crunchy stuff and then make the gravy. I like to use crock-pot liners for ease of cleaning, does that affect the outcome or cooking time? @Sara - You do need to defrost the breast to have it cook evenly and properly. Great question!! @ghada - crock pot liners do not affect cooking or outcome with a turkey breast. use them!! I have cooked turkey breats in the oven bags and they came out really moist. I am concerned now if cooking in plastic is a good idea. Are these bags BPA free ..are they safe to cook with. I don't want to add chemicals to the food. I won't cook anything in plastic. I cook mine in my slow cooker and they turn out great! Plus--the disposable bags aren't very environmentally friendly. I don't mind cleaning a pot/pan after cooking if I know that it keeps me and my family healthy and I'm contributing towards a cleaner, healthy planet! I make my chicken in the oven bags and I love it. Be very careful when using oven roasting bags!!!! 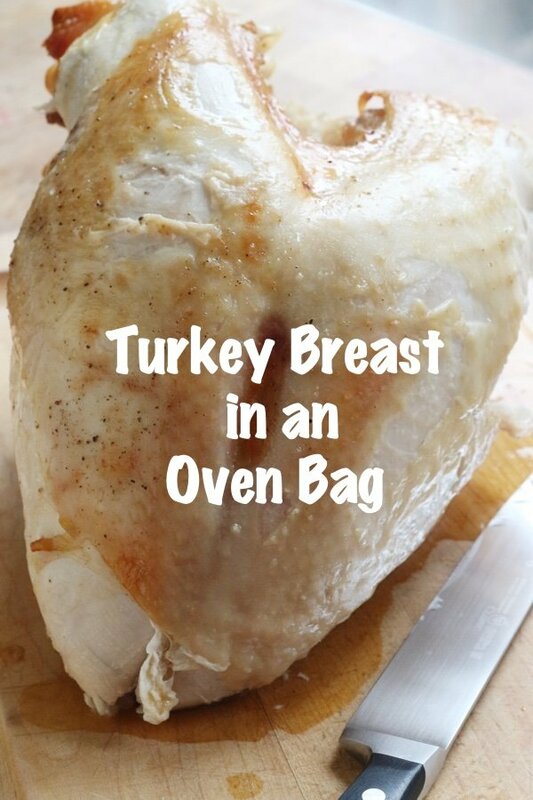 Make sure the pan is large enough to accommodate not only your turkey, but the bag! Last year, on New Year's Day, I had a grease fire in my oven! The bag filled up with turkey drippings, plopped over the side of the pan, and sprang a leak. The dripping juice caused a fire on the oven floor, and burst into flames. I immediately called 911. In less than 10 minutes, I had 3 fire engines show up at my house. The fire was quickly extinguished, but it took months before I felt safe enough to use my oven again! Technically the bags are nylon and not plastic so they do NOT contain BPA. Just letting everyone know I wanted to check for myself. Do you put the breast in the bag with the skin side up or down? Thanks & Happy Thanksgiving everyone. To Lauren: these are NOT...I repeat NOT plastic bags. You had to assume didn't you.. Perhaps you should read before you make your sermon. The bags are a nylon type and no BPAs. Do you really believe Reynolds is that stupid? Give me a break. If you don't do turkey this way, fine. Just learn before you preach. Wow! Just tried for first time ever. In fact, I've not done a breast before....and I'm 70. Always did whole turkey and we had a small dinner today after Thanksgiving with friends. Can't get over how well this worked. I mixed thyme, rosemary and Herbs de Provence into butter and rubbed over bird and under skin. Then used a med, peeled onion and half lemon inside the cavity. This was a most moist bird...first time in 40 years my husband had wanted more white meat.....so yes on this as a method. Bravo! If I am cooking two turkey breasts (1 - 8 lbs) (2nd is 6 pounds) in two large oven bags, would I cook for the same amount of time for both or cook as though it was one big turkey breast? Can't wait to try and get good results. Thanks for the post! 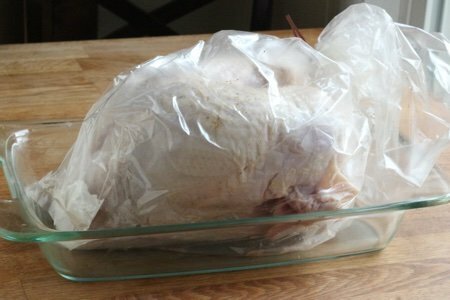 7 lb frozen turkey breast in oven bag @ 325°how much time per pound? TO THAW THE TURKEY:To thaw a frozen turkey, calculate ONE DAY of fridge time for every 4 pounds of turkey. If you need to speed it up...Fill a large bucket with cold water and plunk the still-wrapped bird in and let thaw for 30 minutes per pound, BUT BE SURE THAT YOU change the cold water every 30 minutes to avoid accidentally inviting nasty bacteria to your holiday feast. Once the bird is well thawed...then you can prepare it for roasting. 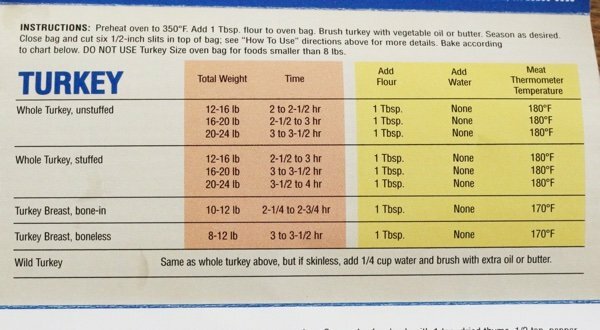 Then follow the directions on the Reynolds Oven Bag ==times differ for a turkey with the bone and one that is boneless. AGAIN..DO NOT TRY TO ROAST THE FROZEN TURKEY...I am 70 years old and I can't ever remember someone telling me they tried to roast a frozen turkey.....first of all...you need to get the giblets out of the neck cavity...do not roast the turkey with those inside the bird. Hope this is of help to you. If. I am cooking to turkey breasts each 5-6 lbs , each in their own bag, do i still follow the time as if cooking one ? ?? I would contact the Mfg directly. Have no clue because I've never done this. Most co's are great answering this type of question. I just started using the bags in 2016 and I was impressed. 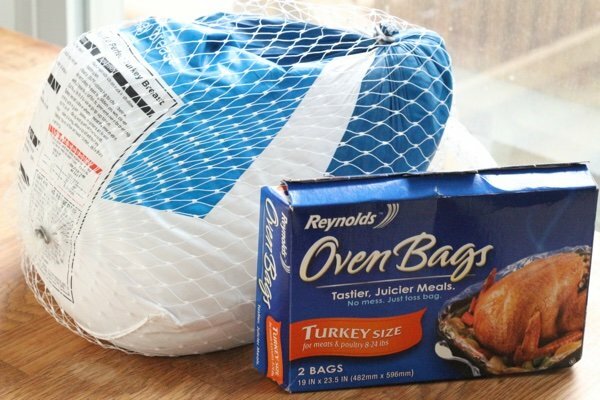 I have been using these Reynolds Oven bags for many years, for my Thanksgiving Turkey and Christmas Hams. *Just a little note, I never add flour to my bags. I do however always add about ¾-1inch of water. And rub the top of Turkey with butter, which will not only keep the skin from burning but give it a nice golden brown finish. I’m cooking two 7lb turkey breasts in separate bags. How much time should I add to the cooking time? I am interested in cooking two turkey breasts in a roaster oven does anyone know how long I cook it? And can I do it in a bag in the roaster? I’m also doing two breasts of about 6 lbs each...same bag or different bags? I’m thinking time is based on one 6 lb as opposed to doubling it as if 12 lbs.?? I’m hoping to have juices to make gravy with. Is that realistic? @Laura - I would keep the cooking time the same. I think your oven can handle 12 pounds of turkey without a big decrease in temperature. @Wendy - I don't know what you mean by roaster oven but you can use the bag in any oven. The amount of time you cook depends on the weight. Check out my photo in the post of times for different weights. @Suzanne - I would use one bag and you might have enough but I would have chicken stock on hand just in case there isn't. Thanks for al the great questions!! Just put our Thanksgiving 7 lb turkey breast in the oven with the baking bag and before doing so shook the needed flour in the bag, rinsed the turkey, salt and peppered it after rubbing with oil. We also added into the bag some cut up onion and celery hoping the bag will catch some of the juices for me to add into the home made gravy before we serve our Thangsgiving feast. 7 lb turkey breast on 350 degrees till it gets to 165 degrees I am guessing will take about 2 hours. Thermometer ready to check later this morning. I always do two breasts, but I always put each one in their own bag. I put both bags in a roasting pan. I use the time for one breast (like 2 hours). When they’re done, I snip the corners of the bag to get the juices for gravy. I don’t think I’ve ever needed to add chicken broth! Not saying this is the way, just sharing what I’ve done in the past! I appreciate reading everyone’s suggestions! If I stuff the turkey breast and am baking 2 8lb breast...how much additional time should I add? I'm going to bake them in separate bags and pans. Thanks in advance! 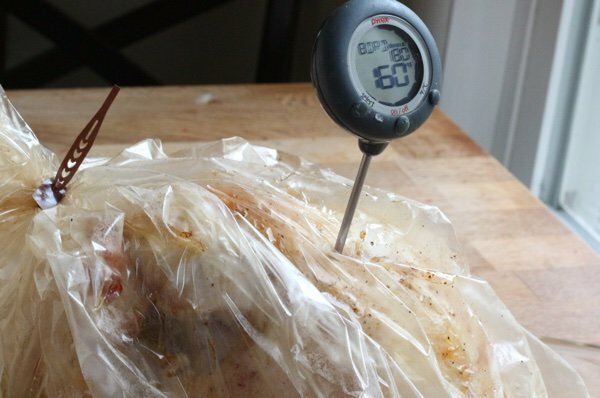 Can I start my boneless turkey breast in the oven bag at a low temp and then raise the temp. To Marcomom and Lauren, Nylon is a polymer—a plastic with super-long, heavy molecules built up of short, endlessly repeating sections of atoms, just like a heavy metal chain is made of ever-repeating links. Nylon is not actually one, single substance but the name given to a whole family of very similar materials called polyamide. Please be polite. Put your turkey or turkey breast in a big enough pan. That is why they make roasting pans which are very deep. This avoids dangerous spills. Invest in one with a rack. Safely THAW your food before you cook it. Does the turkey breast in oven bag get a little golden color so it looks appetizing? Is this a better method than slow cooker? I love the idea of less cleanup because there will be plenty of other pots and pans! If you are doing a whole turkey you should be testing for doneness at the thickest part of the turkey, your photo shows in the breast. Wow. I didn't know that my comment would generate so much ire from another reader. MARCOMOM--It doesn't matter if the bag is plastic or nylon as all of them are reported to leach chemicals when heated at high temps, especially into the skin and juices. Breastcancer.org recommends against using roasting bags due to the leaching issue. I was just trying to inform, not criticize. Reading comments from others helps me learn about different issues so I was just trying to educate. And Susanne Couture--I thought I was being polite---not sure you meant that comment for me or MARCOMOM. Don't take it so hard Lauren. I do the same thing and get flamed all the time. I got used to it. I try to educate too but I think lots of people don't want to know. I can't say I blame some of them because we so often hear of things that are bad for us. I appreciate your knowledge on this topic. Good work. can you roast a stuffed bone in turkey breast in an oven bag. @Joanne - There is no reason why you can't do it. If you can roast a whole stuffed turkey in an oven bag - you can roast a stuffed turkey breast. I would add 1/2 hour to ensure that it call gets cooked. Thanks for your question!! Wow - my husband LICKED the bowl (served with roasted bsprouts and potatoes. Yes, mine browned and must have been tasty. I'm a veg, so I don't eat it, but it was easy and he loved it. Win-win. One more thing that I don't think was addressed is that you can cut the bag open near the end of the cooking time for the turkey to brown. will the skin brown in the bag? @ANNETTE and stephanie - the skin does brown but not like the bird when it is outside the bag. It doesn't get that "CRUNCH" that you get from roasting the bird soley in the oven. Check out my video of the whole bird so you can see exactly what the breast skin will look like. I had googled how to cook two bone in turkey breast, and the advice was to follow directions for cooking time for the larger turkey and add 15 minutes. I am cooking one 8.5 lb and one 7 lb, I'll post results later, Happy Thanksgiving all! I have always used Reynolds bag, however lately the time is not good. I follow the directions to a T and the bottom always looks raw. It happened today AND their was blood by the thigh. I was really frustrated. I have been cooking my bird in the Reynolds bag for at least 40 years. I am 70 now. Always always my turkey is moist, soft, the taste is amazing. My secret: Whole "heads" of garlic, depending on lbs. ,apple, onions, lemon quarters, rosemary, salt and pepper. Enjoy. Ps: use the electric knife for carving. Make gravy from drippings in bag. Delicious. Enjoy!